How have smartphones shaped the way we socialize and interact? Who tracks our actions, our preferences, our movements as recorded by our smartphones? These are just some of the questions that journalist Elizabeth Woyke answers in this muckraking expose of the $241 billion industry that produces more than 700 million devices each year. In the tradition of The Coffee Book, The Sneaker Book, Oil, and Cigarettes, The Smartphone offers not only a step-by-step guide to how smartphones are designed and manufactured but also a bold exploration of the darker side of this massive industry, including the exploitation of labor, the disposal of electronic waste, and the underground networks that hack and smuggle smartphones. Featuring interviews with key figures in the development of the smartphone and expert assessments of the industry's main players--Apple, Google, Microsoft, and Samsung--The Smartphone is the perfect introduction to this most personal of gadgets. Your smartphone will never look the same again. 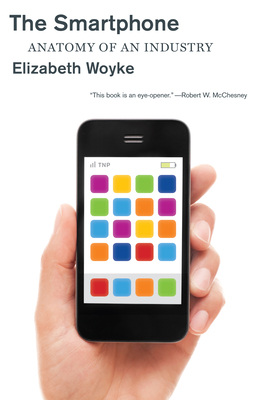 Elizabeth Woyke has covered the telecom and mobile industry since 2007. A former Businessweek and Forbes staff writer, she has also written for Money and Time Asia. In 2011, she was voted a top twenty "Smart Mobile Pundit" by readers. She has appeared on the BBC and other news broadcasts to comment on technology. Woyke lives in New York.